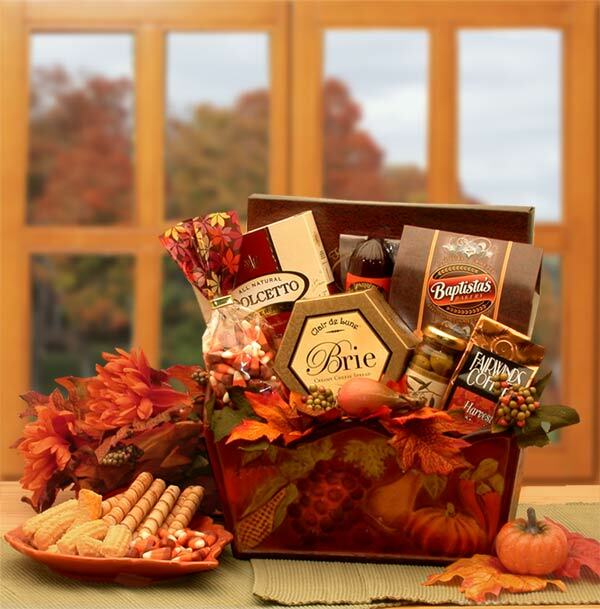 An embossed metal tray adorned with fall leaves arrives filled to overflowing with delicious gourmet foods. Makes the perfect gift for the Thanksgiving Day host or hostess, or for family. Includes: embossed metal tray, Brie cheese spread, Smokey cheese swirls, harvest candy corn, chocolate cream pastry roll cookies, 3 oz summer sausage, pimento stuffed olives, harvest blend coffee, assorted 3 oz European chocolates. Gift measures 12" long by 6" wide and 13" tall and weighs 4 pounds.